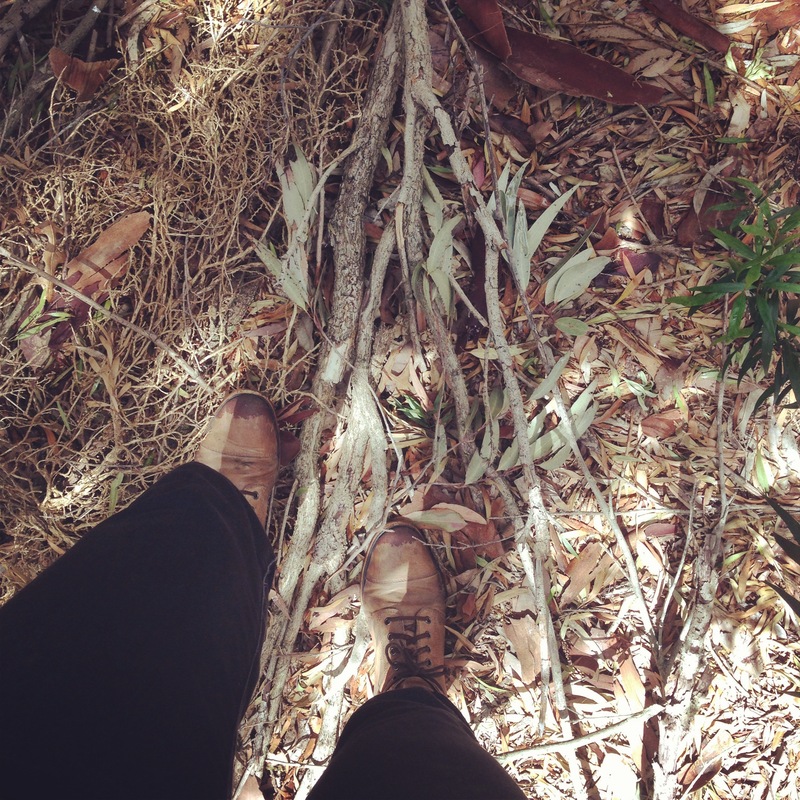 Crunching through the dry undergrowth of a patch of trees in parklands close to my house, I am peering at all the sticks under my boots, looking for the straightest and strongest ones. I hear a loud crunch and a crack from several metres away; the friend I’ve recruited to help me has found something. There are more cracks and crunches and the rustling of leaves — he’s obviously found a pile of them. I crouch down to inspect a pile of sticks and twigs at my feet. Above me a bird calls out again and again in alarm — or perhaps warning — and flits from tree to tree. The air around me smells like damp eucalyptus, after rain earlier in the day. The sticks are mostly unsuitable: too brittle, too bent. But there are one or two that are okay. I add them to the collection I’m already carrying, and clamber out of the bushy area to find my friend. He’s found a collection of larger branches that have fallen from a tree. He holds up the ones he’s picked for my approval, and then breaks up a few bigger branches in the pile for their parts. We carry the collection back to a pile we’ve been making this last hour or so on the edge of a garden bed near where his car is parked. We take stock. There are lots of larger sticks, but we need more smaller sticks. Leaving the pile, we head off again. It’s been windy these last few weeks in Melbourne; the winds that come with the change of season at springtime. For much of that time, I’ve been on the lookout for sticks in parks and under trees on roadsides, anticipating several outings for stick hunting. I want the sticks to build things with in my backyard: structures for beans and peas and cucumbers to grow up, stakes for tomatoes and other plants. The plants are growing steadily in my little hothouse, and I’ve been vaguely planning the kinds of structures I’ll need to construct. I’ve approached the building of my garden coming into this summer season a little differently to previous years. Perhaps because of some other reading I’ve been doing on waste, I’ve found myself trying to think of ways I can make or build things rather than nipping down to the hardware store for bamboo stakes. It’s certainly not that I’m aiming to build everything in the garden from sticks and things I’ve found, but the reading on waste has somewhat shifted my perspective on the usefulness of the things around me. And now that I’m on the lookout for this kind of stuff, I’m seeing it everywhere. 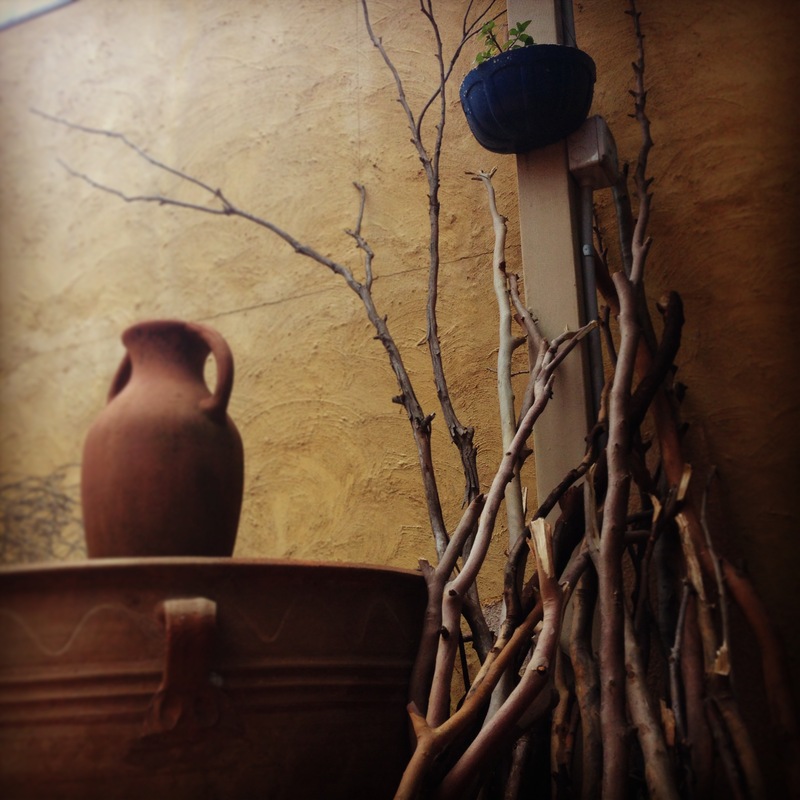 Which is to say that I’m seeing usefulness and abundance everywhere. It’s really rather wonderful. Because it’s not possible for me to carry a giant pile of sticks home on my own (nor, I anticipate, build the planned structures from them), I’ve had to ask for help, and my wonderful friends have been very generous. And this is the other somewhat unexpected outcome of approaching things this way: I have been reminded of the generosity of my friends, and, perhaps even more than that, the stick gathering has been an opportunity for me to spend extended stretches of time with them. Talking about life, solving problems, being serious, being silly, laughing. Late in the afternoon the day before I went stick gathering with my friend with the car, my housemate and I went for a long wander around our suburb, also looking for sticks. We were limited to what we could carry home, but we still managed to gather quite a lot. 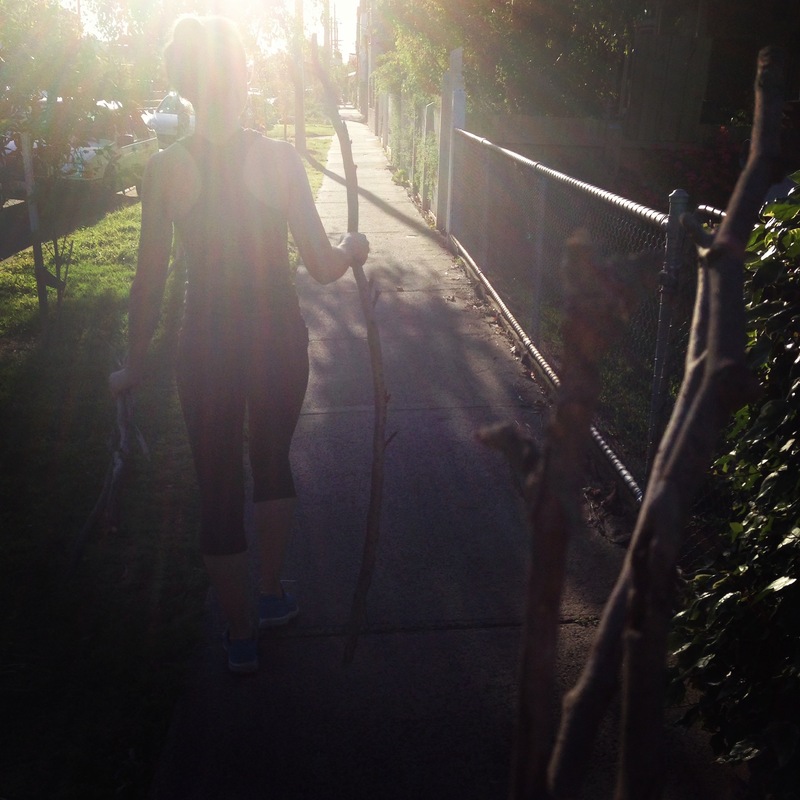 Along with smaller bundles of sticks, she ended up with what she referred to as her “Gandalf stick”, and I ended up with a long branch I carried over my shoulder, which required some careful manoeuvring to stop from catching on things. My housemate said she hoped that one of the people glancing strangely at us as we passed them with our load would ask us what we were doing with the sticks. (Sadly, no one did.) As we traipsed home with our strange cargo, the springtime sun sinking, making everything glow, blinking from behind buildings and trees as we walked, I couldn’t help but feel like this time was something magical. The pile of sticks from both these trips sits now in my backyard, waiting for me to start building. Various friends have promised to help with this job — and with other things in the garden — and I am somewhat overwhelmed, in the best way possible, by how amazing the people in my life are. I can’t wait to share the (literal) fruits of this labour with them later in the season.